RENTON SENIOR ACTIVITY CENTER 211 Burnett Avenue N Renton, WA 98057 425-430-6633 // rentonwa.gov STAFF Debbie Little, Recreation Supervisor Sean Claggett, Recreation Coordinator Ryan Delfin, Recreation Assistant Lisa Wivag, Recreation Programmer Lori Robles, Receptionist HOURS Monday 9:00am–5:00pm Tuesday 9:00am–5:00pm Wednesday 9:00am–9:00pm Thursday 9:00am–5:00pm Friday 9:00am–5:00pm City Officials Denis Law, Mayor Kelly Beymer Community Services Administrator Parks Commission Troy Wigestrand, Chair Cynthia Burns Al Dieckman Larry Reymann Tim Searing Marlene Winter City Council Armondo Pavone, President Ed Prince, President Pro-Tem Randy Corman Ryan McIrvin Ruth Pérez Don Persson Carol Ann Witschi Senior Advisory Committee Peggy Budziu Bill Clapp Dorothy Cook Ruby Griffin Shirley Haddock Sandy Jensen Karla Nuss Sandy Polley Marge Reep Patty Reese Vicki Richards Joe Stewart Kay Stone Milt Tiede The Renton Senior Activity Center, located along the banks of the Cedar River, offers a banquet room with a beautiful view. Amenities include hardwood floors, elegant stage, outdoor patio, and kitchen. RATES RESIDENT NON-RESIDENT Friday (5-hour min.) $650 $750 Saturday (10-hour min.) $1,300 $1,500 Additional hours $130/ hour $150/hour Friday rentals are available after 5:00pm only. A security deposit of $550 is required for all events. PLANNING A PARTY? The Center Has Space for You. BIRTHDAYS REUNIONS ANNIVERSARIES RETIREMENT PARTIES Community Services NATIONALLY ACCREDITED AGENCY SEAN CLAGGETT We are excited to introduce Sean Claggett as our new Senior Activity Center Recreation Coordinator. He is a graduate of Western Washington University with a Bachelor of Arts degree in Recreation Management and a minor in Business Administration. He has worked for the City of Renton for 20 years emphasiz- ing Specialized Recreation and Youth Athletics. He loves to spend time with his family and having extended family gatherings. His motto is any excuse to spend time together is a good excuse. He loves sports and avidly enjoys golf, volleyball, softball, and bowling. He has been a Seahawks fan since 1976 and attends or watches all the games. Go Hawks! RYAN DELFIN Please allow us to introduce our new Recreation Assistant, Ryan Delfin! 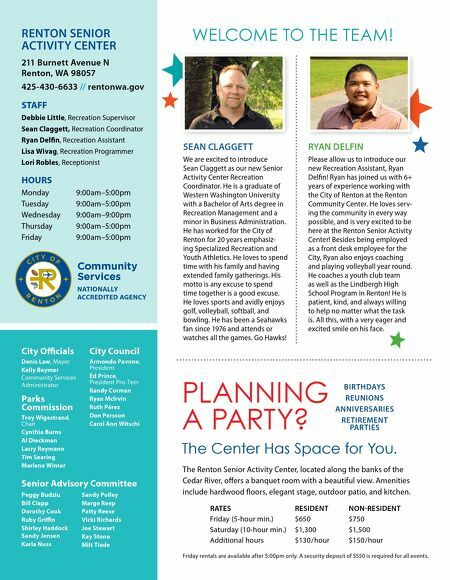 Ryan has joined us with 6+ years of experience working with the City of Renton at the Renton Community Center. He loves serv- ing the community in every way possible, and is very excited to be here at the Renton Senior Activity Center! Besides being employed as a front desk employee for the City, Ryan also enjoys coaching and playing volleyball year round. He coaches a youth club team as well as the Lindbergh High School Program in Renton! He is patient, kind, and always willing to help no matter what the task is. All this, with a very eager and excited smile on his face. WELCOME TO THE TEAM!